For almost 25 years, I have assumed Goldstone was one of my beloved semi-precious stones found in Nature. It’s called stone, right? But no! It is a glass product cooked up by artisans! I am not disappointed, dear readers, because it still is a fabulous glittering glass and it makes a great necklace. I am now informed! The original goldstone manufacturing process was developed in 17th century Venice (and Murano) by the Miotti family and exclusively licensed to them by the Doge. The ingredients include silica, copper and other metal oxides to produce glass containing tiny crystals of metallic copper. I have also used blue goldstone which I now know substitutes cobalt for copper. 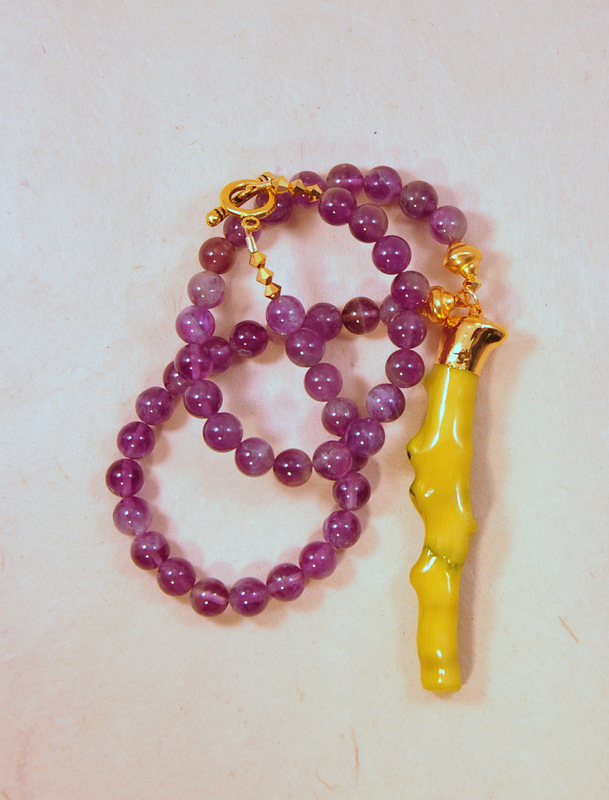 This 22″ necklace contains two sizes of facteted goldstone with a center bead called a briolette, also faceted, which plays up the glitter very nicely. 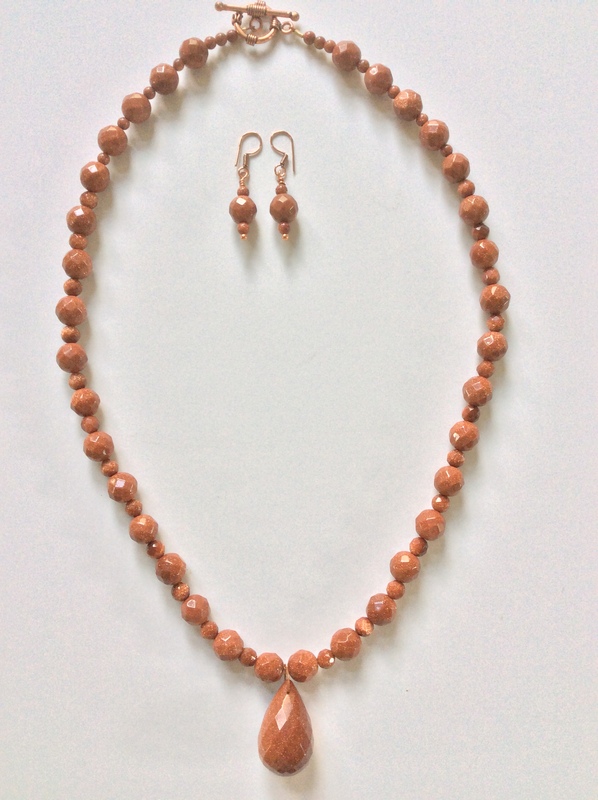 Copper clasp and matching earrings. $69 for the set. OPEN STUDIOS SEASON IS HERE! July was crowded with brisk sales; August 20-21 is next with lots of new work; October 15-16 is a bonus last opportunity for artist-made gifts! Open Studios in Hull is like Christmas in the summer! This year there are 39 artists creating their visual treats to present to you in August and October! Get your info on www.hullartists.com or pick up a free map-flyer at a local business. My July Open Studios was filled with old and new friends and art appreciators! I waved goodbye to 29 pieces, mostly necklaces, but earrings and bracelets also. I love watching my work go to a new home and it motivates me to design more fabulous pieces to take their places! Why such success? 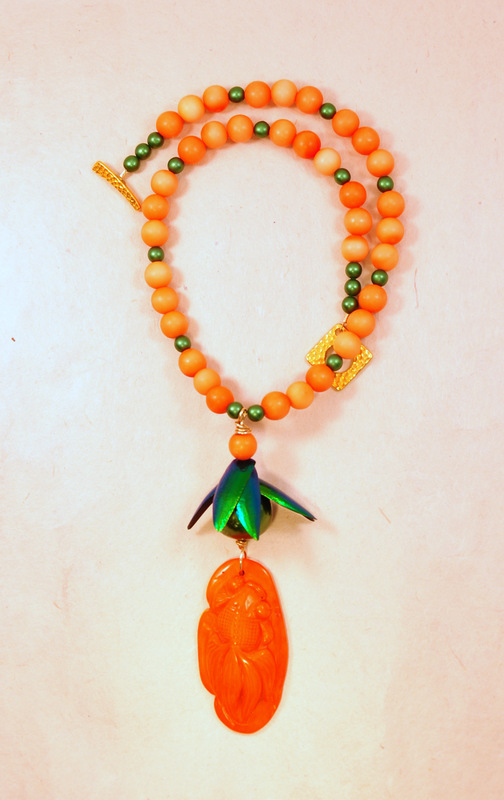 In addition to my beads’ fabulousness; I also cut my prices to below wholesale, making it easier to splurge on jewelry in a still-soft economy. I am also working on re-focusing my creativity to four styles, down from my previous eclectic six + styles. As I approach a big birthday, I’ve indulged in goal-setting and refreshing my work. More on what’s upcoming in the next blog. There are additional reasons for large crowds in July. Hull Artists, now celebrating our 21st annual Open Studios, has grown up! We have engaged in a branding program under the leadership of our own Graphic Artist, Paul Goes. Notice the clean design of our map-flyer, followed up in the posters on the doors of local businesses; yard signs; large signs alerting visitors on 228 and Geo Washington Blvd that it is Open Studios Weekend; our wind sock in distinctive aqua and white; even signs and balloons on street corners where artists are showing! Additional improvements are establishing a data base to alert our visitors about upcoming events (best to state right now it is for our private use only). We jettisoned our old website and introduced a better one…same name…www.hullartists.com. Lory Newmyer and Connie Crosby organized us experienced hands to share our seasoned knowledge of OS with new artists, at two workshops, resulting in upgrades to our customer service. Of course we wouldn’t be fully of age until we engaged social media! Two tireless members set us up on Facebook (Bart Blumberg) and Instagram @hullartistsopenstudios (Connie Crosby). And none of these efforts would have happened without our Fearless Leader, OS Chair Karin Nauth-Shelley. Karin is a Patron Member of Hull Artists and a technical Marketing Whiz in her professional life…as well as a volunteer like the rest of us. Thanks, Karin! I’ll be looking for you August 20 or 21!